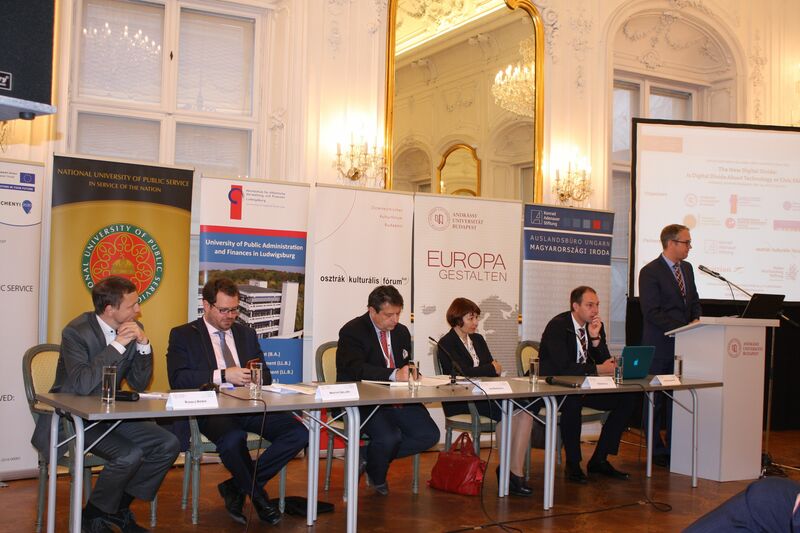 During 4-5 May 2017 in Budapest, Hungary took place the International Forum: Central and Eastern European e|Democracy and e|Government Days 2017. Information Society Development Institute from Moldova was one of the organizers among 5 other well-known institutions: Austrian Computer Society; National University of Public Service from Budapest; Andrássy University from Budapest; University of Public Administration and Finance from Ludwigsburg, Germany; and Austrian Insititute for European Law and Policy. The conference addressed public sector practitioners and policy makers, industry professionals and academia alike. The disciplines covered are primarily information sciences, law and administrative science, political science, sociology and economics. Beyond the general theme papers were solicited in all areas of applying ICT to the Public Sector. Since 2015, the EDEM conference series, organized by OCG since 2007, has joined forces with the CEEeGov Days and strengthens the fields of citizen participation and digital democracy within the conference. Being at the 4th edition, the event gathered more than 120 participants from different countries of the world. A quarter of the published papers (12 articles) belong to the 22 unique authors from 10 institutions of the Republic of Moldova, being a highly appreciated contribution by the organizers. The Information Society Development Institute presented 6 articles, including in co-authored with CNAA, State University of Moldova, ASEM and the e-Government Center. Another 6 articles of the conference were presented by authors from the State Pedagogical University, State University of Moldova, Technical University of Moldova, the Institute of Legal and Political Research of the ASM, in co-operation with the Military Academy „Alexandru cel Bun” and the Academy of Sciences of Moldova. 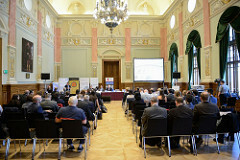 At the same time, 4 of the 21 thematic sessions were moderated by Moldovan colleagues. Dona Scola, Dr. Ruslana Grosu and Anastasia Ştefaniţa moderated the sessions of Privacy and Data Protection, eDemocracy and eGovernment. The active participation and involvement of Moldovan researchers is due to the effective collaboration between Ministry of ICT of Moldova, in the person of Mrs. Dona Scola (former deputy minister of ICT, member of the Committee of Experts in Public Administration of the UN, one of the members of the Program Committee of the Conference) and the Academy of Sciences of Moldova, Dr. Igor Cojocaru (Director of the Information Society Development Institute). - “A New Revolution: Data Revolution (first steps of Moldova)” Irina Cojocaru, dr. Igor Cojocaru, Ion Coșuleanu, Anastasia Ștefanița (IIDSI) and Costel Todor (Civicus CMD, Romania). - "Discussion on Information Society Issues Platform - study case "DISCUS" project, Moldova" Anastasia Stefanita & Ion Cosuleanu (IDSI). - “The Role of Information Instruments in Ensuring Transparency in Scientific Research – the case of the Republic of Moldova” dr. Ion Holban (CNAA), dr. hab. Vitalie Minciună and dr. hab. Gheorghe Cuciureanu (IDSI, CNAA). - “Openess in Higher Education”, dr.Tatiana Chiriac (State Pedagogical University). - “Open Access Policy to Research Outputs in the Republic of Moldova. State of the Art and Perspectives”, Rodica Cujbă (IDSI) & dr.hab. Nelly Țurcan (USM, IDSI). - "ICT Impact on Development of Knowledge Economy in Ukraine and Republic of Moldova" Anastasia Ștefanița (IDSI) and dr. Tetiana Shkoda, dr. Larysa Emelyanenko (Vadym Hetman Kyev National Economic University). - "The Role of Social Media and in Recruitment in Terrorist and Extremist Organizations. Cases of Al Qaeda and ISIS” dr. Ruslana Grosu (Institute of Legal and Political Research of the ASM) and Vasile Bubuioc (Military Academy „Alexandru cel Bun”). - “e-Government Services in Moldova: Value and Opportunities”, prezentat de Mihai Grecu (IDSI) scris în coautorat cu dr. hab. Ilie Costaș (ASEM) și Artur Reaboi (e-Government Center). - "Methodology and algorithm of Information Security Risk Management for local infrastructure" Rodica Bulai, dr. Dumitru Ciorbă, Andrei Poștaru, Rostislav Călin (Technical Uniersity of Moldova). - "Challenges for implementing open educational resources by teachers in higher education” dr. Roza Dumbrăveanu (State Pedagogical University). - “Content analysis of new means of communication in contemporary democratic states” Mihaela Rusu, Academy of Sciences. - “The best practices of online presidential communication in democratic states Romania, Republic of Moldova and Russian Federation” Liliana Rusu, State University of Moldova. On May 3, 2017, the team from the Republic of Moldova participated also at the associated conference Measuring Governance: Theory and Practice, that was roganised by National University of Public Service Budapest, Hungary.